Bench Series before the stroke of midnight. This entry was posted in Bench Photos, Halloween and tagged Bench Photo, Bench Series, Halloween, Halloween Photos, Jack-O-Lantern. Bookmark the permalink. 62 Responses to Happy Halloween! This is my first Hallowe’en out of a village for years. I was invited back, but have to be in to cook hot dogs for my daughter when she comes home from the cinema with her friends. So it’s lovely and nostalgic to be reminded of a family Hallowe’en. Wishing you a very Happy Hallowe’en with your beautiful family. Happy Halloween, Sherri! It looks like someone may have gotten into the candy? 🙂 Boo! forget the coolios and flies – I want stew! 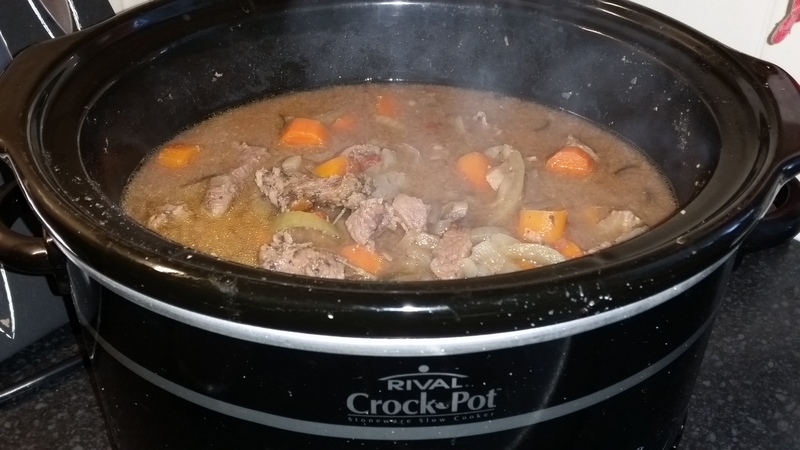 this photo from the reader made me sooooooo hungry and it was great for the first photo in this post – ok – now seriously mon amie – it looks like you make a mean good stew – whew – lots of meat and carrots – wish i was there with bowl and spoon. Happy Halloween, Sherri. Your stew reminded me that my mom used to make her Americanized version of goulash every year. Now I realize it was ghoul-ash lol! Thanks Luanne, hope you had a fun Halloween too! I jumped out of my seat when I read about goulash (haha, ghoul-ash, love it! 😀 ), my mum used to make it and I had forgotten! It was thicker and spicier than a regular stew like the one I made last night, but haven’t had it for years. I’ll have to ask her if she still remembers how she made it, I used to love it! Thanks for the reminder! There you go! Share it on your blog if you find it! Happy Halloween, Sherri. Looks like you were planning for fun. 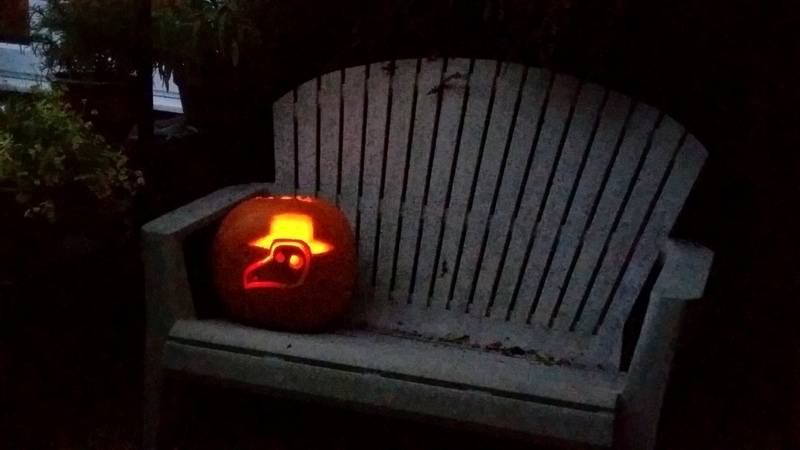 I had been looking forward to seeing what magic Aspie D would weave with the pumpkin. She did not disappoint. Now Plague Doctor has me thinking. Is she a fan of that “plague” app that seems to be taking over the world? Your stew looks delicious. Did you share it with your guests as well or just the treats? I visited my local shopping centre on Thursday evening (late night shopping) and I was thinking of you. The centre was decorated for Halloween and they had staff and customers (children and parents) dressed up to celebrate. The children went around in a group to stores and were given treats. I think the retailers are catching onto the commercial possibilities and are giving it a try over here. Thanks Sherri. Just as well I commented on the pumpkin! 🙂 I wouldn’t have liked to let your down. Ha! That stew looks very heart-warming and delicious. We had not even one trick or treater this year. And now we have not one, not two, but three bags of candy to stare at, challenging our will power. Each bag is a different choice: Butterfinger Peanut Butter Cups is the one that hubby loves, Almond Joys are the ones that I love and one that neither of us love is a bag of Kit Kat Bars. He’s already helped himself to all three bags. And now I’ve hidden them away in a spot I hope to immediately forget about. I can only hope. Next year I’m determined to just buy one bag that no one likes…and if we still get no trick or treaters, I’ll bring it to the office for those candy lovers there. Remind me, okay? 🙂 Hope your ghosts and goblins were plentiful for the evening entertainment! I am, Sherri. Still here and in one piece! 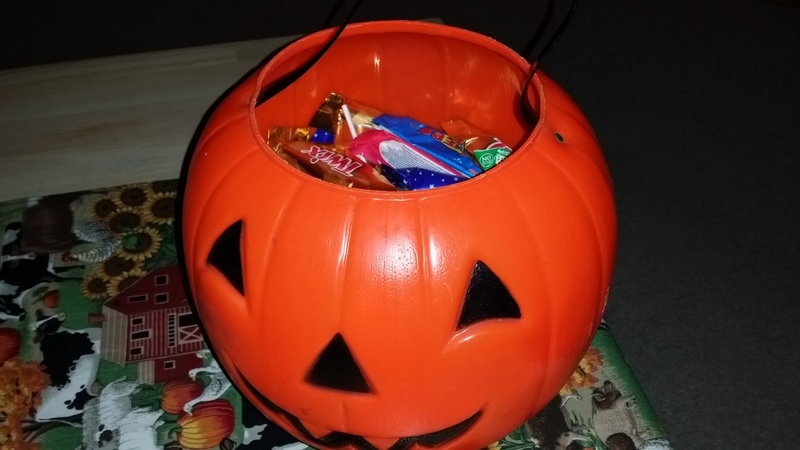 We have never had trick or treaters since we moved to the county forty-five years ago. So for the last twenty-three years that I’ve worked where I do, I take treats for everyone to enjoy all year round. What fun! I love your pictures and hope you had an enjoyable evening. Happy Fall! Hi Renee! Thank you so much, it was a fun night, and I hope you had a good weekend too. And yes, a Happy Fall to you too…such a wonderful time of year isn’t it? I look forward to catching up properly with you, I’ve been on a ‘go slow’ since returning after my extended blogging break over the summer. Great pictures, Sherri, and I loved your daughter’s carving! Last night we had stew, too, mostly so we could eat bits now and then while answering the front door. It was sadder than usual for us; for the first Halloween in 12 years we didn’t have our dog Maggie, and she loved to sit at the front glass door, wag her tale and greet all the kids. But we had 66 trick’o’treaters, and several remembered Maggie and asked where she was. One was so sad that she put down her bag, took off her mask, and gave me a hug. It was very sweet, and Maggie would have loved it. Happy Halloween! 😈 😀 Love the pumpkin! Happy belated Halloween Sherri, it sure looked like fun! The pumpkin looked stunning, great work from Aspen! And the stew looked yummy. I can’t believe Christmas is almost here, I want to start early and buy all my gifts, wrapped and ready, that way, I won’t be sucked in too deep. Do take care of yourself my friend and have a wonderful week! Happy Halloween! Too funny that we both made stew! Aspie rocks the pumpkin carving! Looks like you were very well prepared, Sherri… did you have a good night of it?